EPAM Cloud Pipeline is a web-based Cloud environment that provides the ability to build & run the customized scripts & workflows that support genomics analysis, modeling & simulation, and machine learning activities that are required to accelerate drug discovery research. Cloud Pipeline solution wraps Cloud compute and storage resources into a single service, providing an easy and scalable approach to accomplish a wide range of scientific tasks. Genomics data processing: create data processing pipelines and run them in the Cloud in the automated way. Each pipeline represents a workflow script with versioned source code, documentation, and configuration. Users can create such scripts in the Cloud Pipeline environment or upload them from the local machine. Data storage management: create data storage, download or upload data, edit files right in the Cloud Pipeline user interface. File version control is supported. 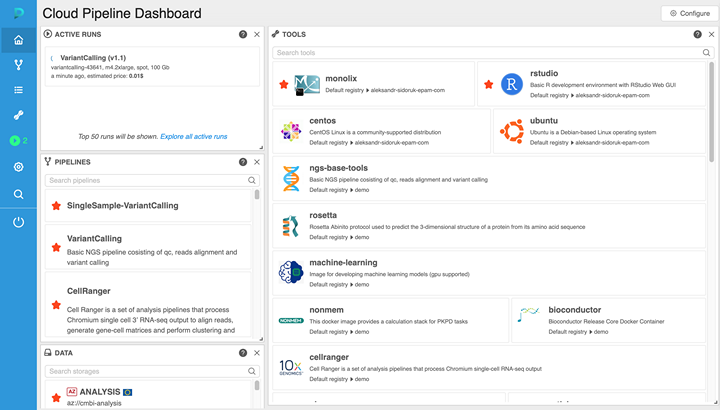 Tools management: create and deploy shared and personal computation environment using Docker’s container concept. Almost every pipeline requires a specific package of software to run it, which is defined in a docker image. So when user starts a pipeline, Cloud Pipeline starts a new cloud instance (node) and runs a docker image at it. Scientific computing GUI applications: launch and run GUI-based applications using self-service Web interface. It is possible to choose cloud instance configuration, or even use a cluster. Applications are launched as Docker containers exposing Web endpoints or a remote desktop connection (noVNC, NoMachine). Cloud Pipeline provides a Web-based GUI and also supports CLI, which exposes most of the GUI features. AI/ML analysis in various areas, including the ones listed above, and many others. Many R&D users, most of whom are scientists and not IT specialists, are not comfortable using cloud facilities directly (e.g. using command line interfaces and scripting languages). A few cloud-based offerings are available that offer Web UI to access data storage and pipeline building tools, however migrating pipelines from on premise to these platforms requires significant rework of existing workflows/scripts. Integration of cloud applications with on premise applications (hybrid architecture) is often required; for example, when a database for annotating genes and pathways, or a license server for certain software is installed on premise. Integration with an enterprise’s user management/authentication system is usually a requirement, and using SSO (Single Sign-On) mechanism is a great benefit for users. Scientists and researchers need access to a scalable computational cluster to solve their most compute intensive tasks, while at the same time reliable mechanisms are needed to control cloud spending. 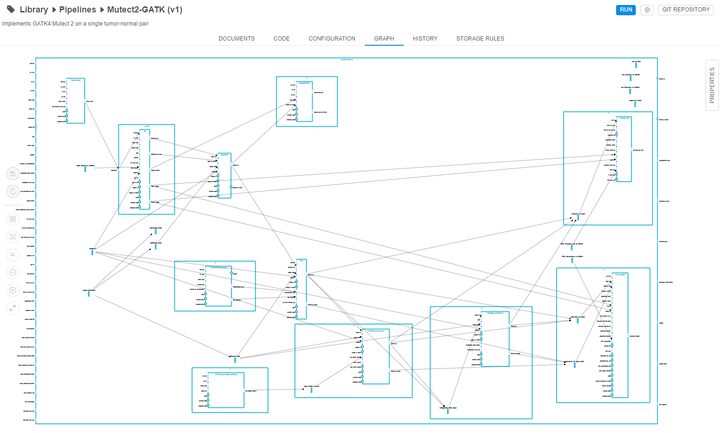 Support for multiple bioinformatics and modeling/simulation tools from an extensive library of Docker container images that are executed on cloud instances or clusters. Users can access active instances via Web based SSH connection, execute scripts, modify images by installing software packages, and commit modified images to the user’s personal repository. Ability to launch and manage interactive tools and applications with Web or Linux Desktop UIs. Users can build custom pipelines using a mixture of languages (including shell script, Python, R, Java, Perl, WDL, etc. ), and save them to a built-in, version-controlled GitLab repository. Ability to create cloud storage units that upload and download data using a Web UI, Command Line interface (CLI) or by mounting storage folders to local Windows/Linux/Mac workstations. Ability to store and process data in multiple cloud regions. Management of data access permissions for both internal and external users. Support for thousands of users, utilizing thousands of nodes, and tens thousands of cores simultaneously. 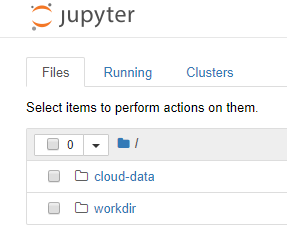 Support for single/multiple computation node configurations, as well as auto-scaled SGE clusters, MPI-based clusters, various CPU/GPU/Memory/Disks configurations. Protecting data using data-at-rest and data-in-motion encryption. A key innovation is providing users with a self-service environment where they can flexibly build and execute their own pipelines/models, while preserving the highest levels of safety for the data and application. Users can choose the cloud instance configuration and region and request launching a regular or auto-scaled cluster without being a cloud or IT expert. Cloud Pipeline has a cloud-independent architecture, which makes it simple to port the solution to various cloud platforms. Currently AWS, Azure, and GCP are supported. Cloud Pipeline uses Docker containers and the Kubernetes engine to orchestrate the execution of containerized applications. Cloud Pipeline has been implemented as a Virtual Private Cloud solution, that retains control over network connections and provides security and integration mechanisms for the enterprise’s IT/Security team. Integration with on premise clusters and applications, as well as with external clouds is fully supported. The platform also can host/execute Web-based applications tightly integrated with computation and storage facilities, and security mechanisms. 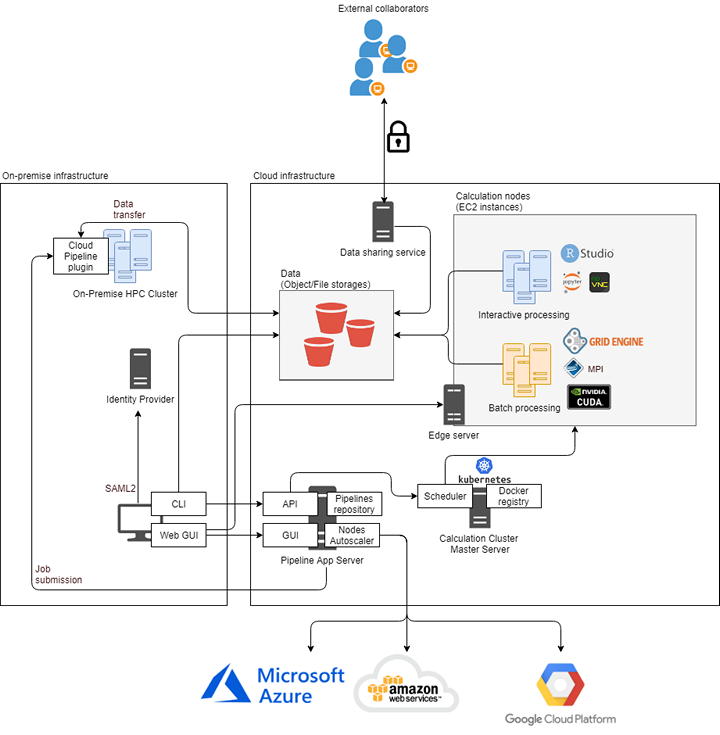 A powerful API allows external applications to leverage Cloud Pipeline’s tools, storage, clusters and instances to perform the computational work and retrieve the result data for further processing. Cloud Pipeline source code, documentation, guides how to build and start are accessible at GitHub. Copyright 2017-2019 EPAM Systems, Inc.